Great saw, cuts well with plenty of power. Electric brake stops on a dime. Guard works well. The only downfall is the safety switch is awkward to reach while holding the saw and trying to pull the trigger. As a post and beam framer I would recommend this saw. This is a great saw for cutting larger dimension material. I have used the older saws that were gold in color and they were not bad but this new model has a better platform and adjustments.I have been cutting 16/quarter mahogany with this saw and it does not bog at a reasonable cutting speed.The blade that comes with the saw is decent, however,I purchased a 60 tooth blade (Amana), from a local tool supply for about $130 and this blade cuts a little smoother. The only thing that I did not like about this saw is the safety button. It is hard to push with the edge of your thumb I modified mine with a half-inch ebony plug epoxied to it. It looks like it came from the factory like that and is, in my opinion, safer to use. this BIG saw is just what it takes to cut all the way through a stud wall. I am a professional remodeler and for increasing the size of door and window openings I used to have to cut one side and then try to cut the other with a recipro saw or take another cut with a circular saw from the other side, NO MORE!only thing the saw needs are reigns and a saddle! I purchased this saw to cut several 4x4 landscaping timbers to outline a driveway along with a variety of mulch beds. This saw is a beast. The two handles are definitely needed to control it. Positioning the saw to begin the cut and turning it on in conjunction with depressing the safety button is definitely a challenge as other reviewers have stated. However, once you develop a technique it becomes less burdensome. The saw does not have a soft start feature and will jerk when first turned on. It also is equipped with an electric brake which performs as expected. The 32 tooth stock blade is OK for rough cuts. The blade stabilizer is effective in preventing excessive runout. With the stock blade the saw will bog down if you force the cut and not let the tool do its job. But it still is a fine tool for making cuts on wood with such large dimensions. I constructed some jigs to make the alignments of my 90 and 45 degree cuts much easier. Please view this video to see the saw in action using one of these easy to make jigs. 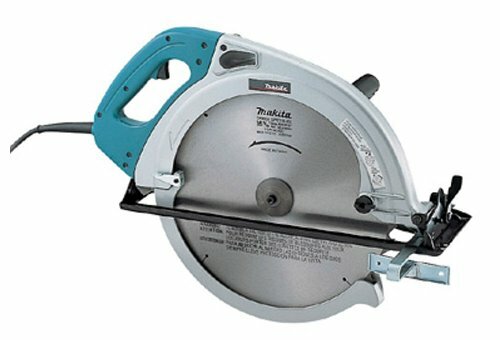 http://video.aol.com/video-detail/makita-beam-saw-cutting-with-jig/1638302903. If you have some large timbers or landscaping ties to cut, I would definitely recommend this saw. and would recommend this saw to anyone who is doing the same. Great for Log Home building! My husband purchased this for building our log home... it was the only tool that could cut through the logs in 2 passes. My husband is quite picky and he was very pleased with it.